Maldivian troops blockaded parliament and clashed with opposition leaders for a second day, witnesses said, as political turmoil escalated in the troubled honeymoon islands. Earlier this week President Abdulla Yameen ordered troops to evict the country's legislators and prevent the impeachment of his speaker, the opposition said, in the latest turmoil in the honeymoon islands. Maldivian troops blockaded parliament and clashed with opposition leaders for a second day, witnesses said Tuesday, as political turmoil escalated in the troubled honeymoon islands. The latest turbulence came as the United Kingdom urged its citizens to take caution in the capital Male after soldiers tear gassed protesting politicians there. Soldiers barred the main opposition Maldivian Democratic Party (MDP) from entering the heavily guarded parliament complex again Tuesday, with witnesses reporting shoving as MPs were forced back from the barricade. 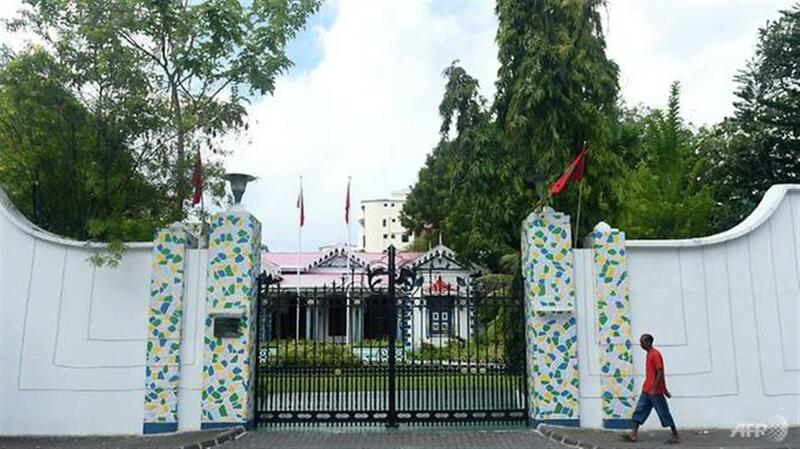 "Even when parliament is not in session, MPs are free to go to the building and attend to their work, but it is not allowed now," MDP spokesman Hamid Abdul Ghafoor told AFP. "This is ridiculous." The parliament gates were padlocked by soldiers Monday in a move described as illegal by exiled Maldivian opposition leader Mohamed Nasheed. An opposition coalition, united against President Abdulla Yameen, had been threatening to move a no-confidence motion against the speaker in a bid to impeach the president's ally. But MPs trying to enter the compound were hit with pepper spray and forcibly evicted.? Yameen's office said in a statement Tuesday that parliament was closed ahead of an "incoming VVIP visit". Pakistan Prime Minister Nawaz Sharif is in the Maldives as the tropical island nation celebrates its 52nd anniversary, the Pakistan High Commission in Sri Lanka said. "The special measures taken by the security forces at the parliament building on 24 July 2017 were to ensure the security and safety of the premises, as mandated by the... constitution," Yameen's office said. Residents said security in Male, a congested capital just one-square mile (two square kilometres) in size, was tighter than usual. The UK government urged its citizens to avoid large gatherings and protests following the disturbance around the parliament building. "Previous demonstrations and political protests have led to violence and arrests," the updated travel summary said. Months of political upheaval in the Maldives has dented its image as a honeymoon paradise. The United States and other nations have urged the Maldives to safeguard democracy amid a crackdown by Yameen on his political opponents, most of whom are in exile or jail. The opposition coalition, led by Nasheed, wants to defeat Yameen at elections next year but is struggling with its leadership in tatters. Earlier this month they secured enough support from government defectors to begin impeachment proceedings against the speaker, hoping to weaken Yameen's grip on parliament. However the parliament secretariat declared the impeachment motion was invalid, scheduling the next sitting on July 31. In 2015, he was sentenced to 13 years in prison on terrorism charges that were widely seen as politically motivated. ?He now lives in exile in Britain.